My children love all holidays equally because it's a time for fun and crafts! 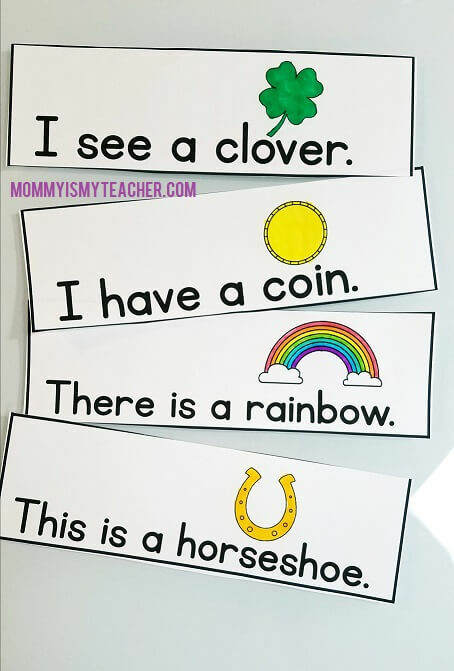 I always try to throw some learning in, so here's a fun St. Patrick's Day Sight Word Reader. Scroll down to the bottom to download the free St. Patrick's Day Sight Word Reader. First, read the sentences with your child. I think that this book can be read for preschool, kindergarten, and first grade students. Cut out the strips. Have your child read the sentences again. Color the pictures. I like adding a picture to the top of new words to build confidence in young readers by giving them a visual clue. Last, staple the book together. I have always used the learning games from the Starfall Education Foundation even when I was a classroom teacher because my students used to love to play games to improve their reading. 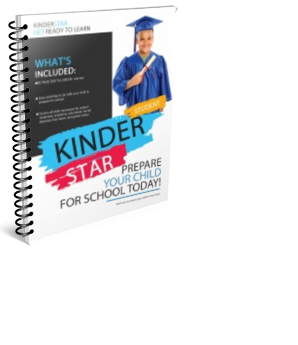 So I was very excited when I was chosen to review the The Starfall Home Membership with my children and see the other materials inside of Starfall. First children can customize their avatar in the “Who Am I” section. My twins love to take turns customizing their person, changing the clothes, and learning about their body parts. The Starfall Home Membership can be used on the app or on the computer. We mostly used the computer so that the twins could actually share the screen. With my four-year-old twins, we focused on the Learn to Read section. This section is broken down by word family, and focuses on a specific skill for each lesson. My twins love the games that are included with each lesson, and I use them as a motivational tool after reading. First I would read the story with them, then have the story be read to them. There is an ear icon that children can click to listen to the story being read to them. They would then practice reading the story by themselves. Last, they played the word family game and watched the video. This is probably my twins favorite part of Starfall. They love the Motion Songs that include all of their favorites such as If You’re Happy and You Know It, and Teddy Bear, Teddy Bear. They like to follow along with the video while singing and getting exercise. Motion songs are a great way for young children to practice their gross motor skills and learn spatial awareness. Did you know that The Starfall Home Membership also has an elementary section? The elementary area covers first grade and some second grade skills. The first grade section is aligned with the Common Core state standards which are taught in a majority of the states. Even if you don’t homeschool, it would be great extra practice or review for first graders. My seven-year old daughter really benefited from the math videos because they are easy to understand and interactive. Since math is her area of improvement, we focused on the math lessons. I like how the program has children interact with the lesson by clicking on the math manipulatives and answer the questions. She enjoyed the math videos that made the concepts easy to understand. The first grade reading section goes over the different genres such as myths, folktales, poetry and plays. The poems are written by well-known authors, but are illustrated and animated to make them interesting to young children. Math skills for second grade include multiplication, place value, addition, and subtraction. Once my daughter completes the first grade section, then I will use the second grade section to prepare her for the next school year. There is also a Parent-Teacher Center section inside the Starfall Education Foundation. This area is helpful to learn more about the benefits of the website, as well as resources for your child. 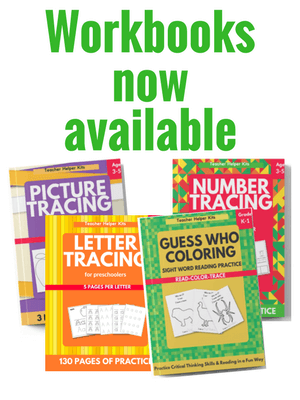 There are printables that go along with the lessons, handwriting worksheets, math practice, and more. My children enjoy using the The Starfall Home Membership. I think that it is a great way to assist learning and struggling readers in a fun and interactive way. The yearly membership is also a great supplement to any homeschool curriculum for young elementary students. Many parents want to begin teaching their child to read, but don’t know where to start. Yes, children do learn how to read in school. However there are many reasons why you should begin now at 3-5 years old to teach your child to read. First, your child enters school prepared and confident. School is so much easier when a child knows what to do. Another reason why you should teach your child to read before they enter school is that you can understand what their needs are and what they still might need help in. Reading is a process, so children need time to practice their skills. At school, children don’t have a lot of time to practice one skill before it is time to learn a new skill. As I was looking for a complete reading curriculum, I found Learn to Read. My children already went through the Reading the Alphabet curriculum and I was impressed by the detailed information and lesson plans. Reading the Alphabet is good for 2-3 year old children who know their letters and letter sounds and are ready for a relaxed approach to read. Learn to Read is a curriculum for beginning readers (4-6 yrs old) that teaches reading and spelling through common word families and beginning sight words. It is important to understand that only learning sight words is not knowing how to read. Sight words help young children gain confidence and begin to understand that words have meanings. However for children to truly to learn how to read, they need to know the sounds that each letter makes. Once your child knows their sounds, they need to start putting the sounds together. Most teachers begin teaching word families, which are words that have similar endings. For example, the –at family includes the words: cat, hat, mat, sat, etc. Teaching word families allow children the ability to master one word family at a time, then gain confidence in their reading. As they learn more word families, they increase their reading ability. The way that Learn to Read is set up it teaches different word families in each unit. It also includes sight word review in each lesson. Note: Learn to Read is sold in individual units, but if you plan to work with your child through the summer or continuing homeschooling through kindergarten, the bundle is a better deal and saves $12. The bundle pack also contains extra activities for children to reinforce the skills. Each lesson includes a 5-day lesson plan. Since my twins are in extracurricular activities throughout the week and I follow a more relaxed schedule, we are doing one lesson for 2 weeks. This also helps to ensure that your child really knows the skill, instead of rushing to the next word family. I use my alphabet foam letters to go over the word family. (What does a say? What does t say? Put the letters together. Then say this is the word family that we will practice this week). Learn to Read also includes word cards to practice the word family if you don't have alphabet letters. Each lesson has sight word activities, writing, a short reader and more that focus on the specific word family. I try to limit activities to no longer than 20 minutes at a time. Also, it is a good idea to switch from a “worksheet” activity to a hands-on activity to keep your child engaged. In our complete preschool homeschool schedule, I switch from a reading activity to an activity from our current theme. 4. During your bedtime story or read-aloud time, point out the words in the word family. Say, “Do you see (at)? Point to it. Read the word. COMPREHENSIVE! I mean, it has everything that you need to teach, review, and reinforce each word family. Works for struggling and special needs children- even if your child is in kindergarten or first grade and needs more assistance, Learn to Read is a good review for them. The only thing I don’t like about Learn to Read is there is no complete year plan. I would love a complete day to day schedule for a 9 month plan, or a 12 month plan. This would make it easy to know exactly what to do for each day. However, since all families are different I understand that it is written to be flexible to incorporate into your day. This is mostly because I don’t want to create my own. Reading is a daily practice. Take your time. Reading is not a rush, if your child is tired, stop. Learn to Read is a comprehensive and affordable reading curriculum to teach your child to read. It is a simple way to teach your child to read. Even if your child only goes through a few units, they will be more prepared for school. What other questions do you have about teaching your child to read? Leave me a comment below! Every parent has heard about sight words, and should know the truth about sight words. However, you still have to help your child learn their sight words in order to prepare her for reading. 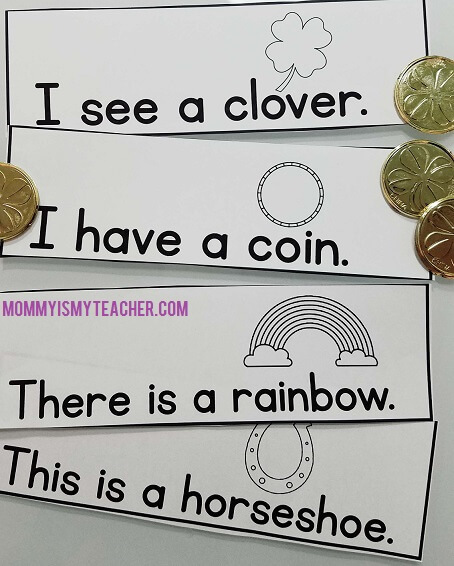 Here are some of the best sight word activities to help your preschool or kindergarten child learn their sight words. This is an easy game to set up and play either indoors or outdoors. Visit Sparkling in Second to learn more. This super simple activity from Gift of Curiosity will have your child wanting to learn their sight words! These Lego Duplo towers would be a fun activity. Choose a few sight words that you want to focus on and watch your child build and practice letter recognition. Visit Mom Inspired Life to see the full activity. This is a variation of bowling, but involves cups! I like how they can build and rebuild their sight word stack so this game will never get old. Visit Coffee Cups and Crayons to view the full post. This takes a bit of prep, but is so worth it! Write sight words on playdough and have your child squish or smash the word with a toy hammer. Go to Life With Moore Babies to get the full directions. My twins love using playdough at any time! These fun and free sight word playdough mats make learning sight words interactive. Plus, it gives your child a chance to practice their fine motor skills by working with the playdough. This is a no prep sight word activity that’s super simple! Use toothpicks or small sticks to write sight words in playdough. Visit Fantastic Fun and Learning to get the full activity! I like this fun craft because you can adjust it for the seasons! Have your child feed the sight words that you are reviewing to the monster! Go to the Craft Train to see how to make it. Use letter magnets and sight word cards to build sight words. Super simple and very easy! She uses a magnetic filing cabinet, but you can use a cookie sheet for the activity. Go to Who’s Who and New to learn more. One more playdough idea! I like using playdough because of the sensory play my children get, as well as it makes them forget they are learning! Use magnetic letters or letter stampers to spell sight words. Visit Learning 4 Kids to learn more! Need printables to help your child practice their sight words? This 100-page pack of Sight Word practice includes the first 50 sight words. Each word has a practice page where your child can read, color, and trace the word. The second sight word page has large letters for your child to cut out and color. Then they can paste the letters on a construction paper to spell the word. 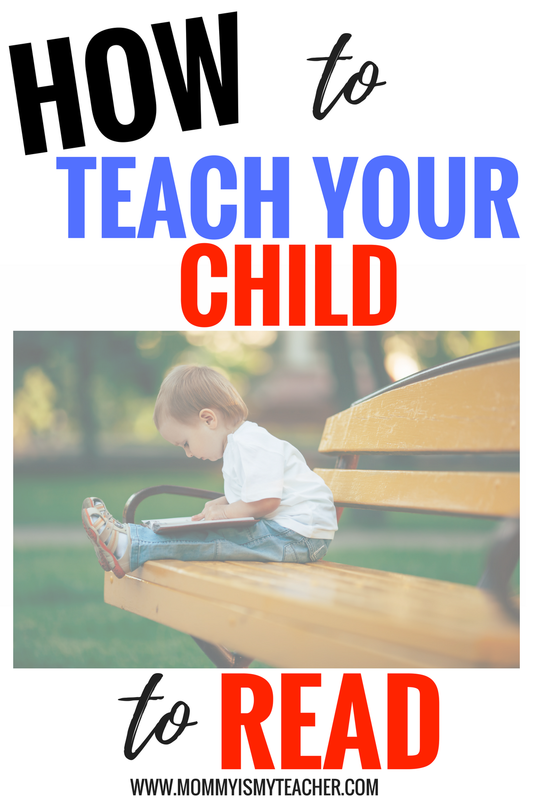 After I wrote the post on how to teach your child the alphabet, I received a lot of questions on exactly what to do after your child knows the letters and sounds. In my book KinderStar, I go over many alphabet activities that can be used to teach your child the alphabet. Once your child knows her letter and sounds, then they are ready to begin learning to read. An easy preschool reading curriculum is Reading the Alphabet. If your child is not yet ready to read the alphabet, then you should complete Learning the Alphabet first. Reading the Alphabet is a free, yes, free pre-kinder reading curriculum developed by literacy specialist and homeschooling mom, Becky, from This Reading Mama. Who is Reading the Alphabet for? My three year old twins will be going through her Learn to Read Curriculum beginning in August, but this summer we will be reviewing certain parts of Reading the Alphabet. Each lesson is designed for a 4 or 5 day week. There are a lot of activities to complete for each letter. My children like the pocket chart sentences as well as the sight word songs. The lessons include a lot of fine motor skills practice such as cutting, pasting, and even fun bottle cap games. None really. The only thing that is missing is the book list for each lesson for the word families (i.e. –ig, -ug). I like to reinforce the skills that we are doing with a related book. This not only gives children confidence to read alone, but also helps them recognize words in new contexts. However, these books are easily found online so it is not a big deal. Another benefit of Reading the Alphabet is that it only uses a few basic supplies. Although the entire curriculum is available in individual downloads for free, there is also a special bundle available with all of the units as well as bonus pages for only $12. The main reason I like the bundle (besides the bonuses, of course), is that everything is all in one place. The best part of Reading the Alphabet is the flexibility. Some lessons might take longer than others, and that’s okay. As a mom you can decide what your child needs more practice on. Or you might have twins or are teaching two children at once, and each child has different skills to work on. I don’t print out every single activity, just what we need. The handwriting pages can be slipped inside a sheet protector and used with a dry erase marker so they can be reused multiple times. Since preschool is between the ages of 3 and 4, it depends on how much you have already taught your child and what his needs are. My three year old twins already know their sight words and are ready to read, so we will be starting a different curriculum, Learn to Read (which is also available in her shop) in the fall. However I will be reviewing parts of Reading the Alphabet in the summer to give them extra practice with the sounds. If you are looking for a quality reading curriculum for your preschool homeschool, then you should check out Reading the Alphabet. Once your child finishes Reading the Alphabet, or if it seems too easy for your child then I suggest Learn to Read. Learn to Read is a faster paced, reading curriculum that focuses on word families and short vowels to help your child become a more fluent reader. Many parents don’t know that for kindergarten readiness, it is important to teach your child some reading skills. What reading skills are needed to see if your child is ready for kindergarten? 1. Know that words make up a sentence. Preschoolers should know that words come together to form a sentence. As you are reading with your child you can point out the words in a sentence, and the whole sentence. This helps them understand that words come together to form meaning. 2. Know that letters make sounds. Once your child can recognize their letters, you can begin teaching them letter sounds. Knowing letter sounds is crucial in being able to read. 3. Break words into syllables. Preschoolers should know that words can be broken into parts called syllables. Note: They do not need to know the word syllables, just understand the concept. Activity: Say a word with your child and clap while you say it. (ex: pea-nut, two claps) Your child will be able to hear the syllables in these words. Rhyming words are words that have the same end sound, they do not necessarily have the same spelling. 5. Know beginning, middle, and end sounds in words. Kindergarten readiness requires preschoolers to understand that words are separated into sounds. Most words can be broken up by beginning, middle, or end sounds. Kindergarteners will have to identify the sound in a certain part of the world. Why are these reading skills so important for kindergarten readiness? All of these skills come together to prepare your child for reading. By working with your child on these reading skills, they will become ready for kindergarten. How can you help prepare your preschooler so they will be ready for any kindergarten readiness assessment? Read to your child daily so that you can point out each skill while reading. What other questions do you have about reading skills needed for kindergarten readiness? Leavea comment below. Every preschool parent has heard of the term "sight words" but what exactly are they, and what should you know about them? 1. There are two lists of sight words commonly used Dolch and Fry. Dolch sight words are less current since they have not been updated. The list contains 220 “service words” plus 95 high-frequency nouns. These words comprise 80% of the words you would find in a typical children’s book and 50% of the words found in writing for adults. The words on the Fry list include all parts of speech. You can use whichever list you prefer, as some words overlap. The main purpose is to teach your child words that are seen over and over. 2. 90% of all reading is sight words. Think about it, most of the time that you are reading you aren’t sounding out words. Children’s literature is made up of a list of about 1,000 words, so if your child can recognize sight words they will be on their way to reading. 3. Entering kindergarteners should know sight words. Although kindergarten readiness doesn’t require students to know many sight words, it is a good idea to teach your child sight words to get ready school. This will prepare your child for school by having a few words in their belt. 4. Learning sight words does not mean your child can read. Knowing sight words means that your child can recognize words that are not easily decoded, or words that can be sounded out. Sight words help your child read easier, but children still need to know phonics rules in order to read fluently. 5. Sight words are easy to learn. When should you teach a child sight words? All children are different, but even children as young as two can watch Meet the Sight Words for a few minutes. As your child gets older you can play sight word games, read sight word books, or even go over sight word flashcards. How many sight words should you teach at a time? It depends on the age, but I recommend no more than 3 at a time. That way you can make sure your child really understands those three words before moving on to the next words. Need sight word resources? 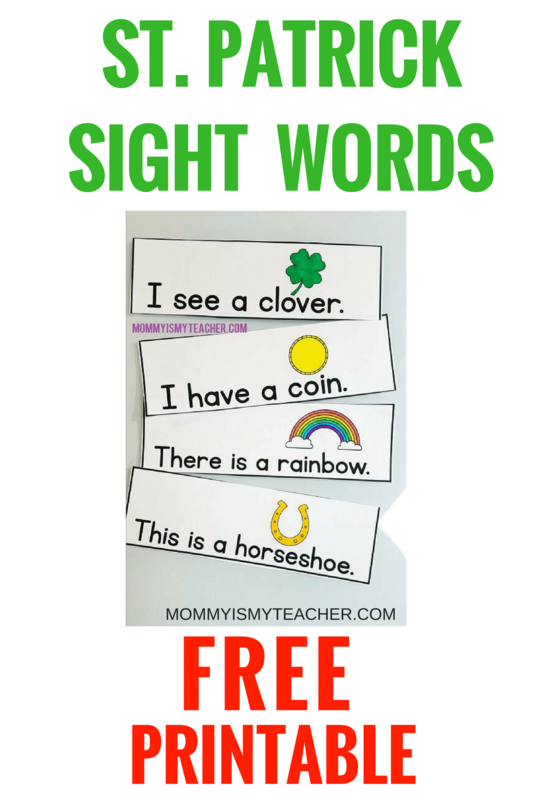 Don’t forget to download my FREE sight word activities. What other questions do you have about sight words? Leave a comment below. March is Women's History Month and is a great time to introduce your children to these amazing and talented women. Since Social Studies is often either not taught or very briefly taught, it is important to teach your children about topics they would otherwise miss. Also, many times our children are hearing about the same people over and over, and while they do have their place in history I want my children to see women in more positive roles. There are countless books that could have made the list, so I had to narrow it down to 20. Each of these women were pioneers in their field and by learning about them, it will broaden your children's horizons. Mom Note: This is a great way to introduce nonfiction to your children, which will become more required reading as they advance in school. This book about ballerina Misty Copeland is so inspiring and the illustrations are amazing. The story of Bessie Coleman is told in this nonfiction picture book. If your children love The Wiz, you have to get this book! The illustrations are amazing and they will love to hear the story of Miss Lena Horne. If you have a baseball fan, your children will love to hear the untold story of Effa Manley. Effa Manley was the first and only woman to be inducted into the Baseball Hall of Fame. This book tells the story of Fannie Lou Hamer through poems and collages. This book is for older children since it talks about the struggles Ella Fitzgerald faced in plain language. Edna Lewis was one of the first chefs who introduced Southern homestyle, all-natural cooking to people. Learn and read about singer Marian Anderson. Althea Gibson was the first African American ever to compete in and win the Wimbledon Cup. Before Wilma Rudolph was five years old, polio had paralyzed her left leg. Everyone said she would never walk again. But Wilma refused to believe it. Not only would she walk again, she vowed, she'd run. And she did run--all the way to the Olympics, where she became the first American woman to earn three gold medals in a single olympiad. This story of Rosa Parks is told with bright illustrations. Learn about Ruby Bridges, who integrated an all-white school in the 1960s. This legendary tale introduces young readers to Molly Williams, an African American cook for New York City's Fire Company 11, who is considered to be the first known female firefighter in U.S. history. This nonfiction book tells the story of the passionate performer and civil rights advocate Josephine Baker, the woman who worked her way from the slums of St. Louis to the grandest stages in the world. Meet Mae Jemison, the first African-American female astronaut! The inspiring true story of Florence Mills a Broadway singer. Read about Simone Biles, record-breaking Olympian. This book is great to introduce your child to current events and women who are making achievements at young ages. Told by Gabby Douglas, this book is a great nonfiction read with behind the scenes pictures. Serena Williams is one of the best tennis players ever. Also, this is another book that will keep your child engaged while learning about someone that is current and relevant in today's time. Twenty-six amazing women; twenty-six amazing stories. What are you reading for Women's History Month? Leave a comment below. Every mom has probably heard about the Bob Book Series. Designed to help children learn to read, these simply illustrated books focus on one sound per book.